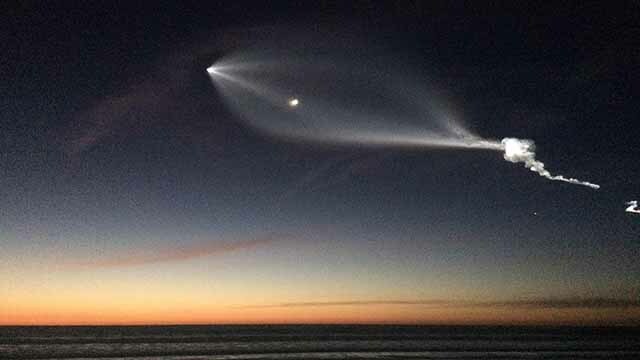 With storm clouds moving out of the area, Southern California could be in for another spectacular light show Friday evening, with a rocket carrying a reconnaissance satellite scheduled to launch from Vandenberg Air Force Base in Santa Barbara County. If successful, the launch will be the second rocket to take off this week from Vandenberg. Hawthorne-based SpaceX launched a Falcon 9 rocket from the base Monday, carrying 64 satellites into orbit. Friday’s launch, scheduled for 8:19 p.m., is being carried out not by SpaceX, but by United Launch Alliance, a joint venture of Lockheed Martin and Boeing. ULA’s Delta IV Heavy rocket will be carrying a secretive satellite for the U.S. National Reconnaissance Office. According to the company, the Delta IV Heavy rocket includes three Rocketdyne liquid hydrogen/liquid oxygen engine that can produce a combined 2.1 million pounds of thrust. As of Thursday afternoon, the weather forecast for the Lompoc area was indicating a “40 percent chance of favorable conditions for the liftoff,” according to ULA. “The only concern for a launch weather rule violation will be winds,” the company stated.